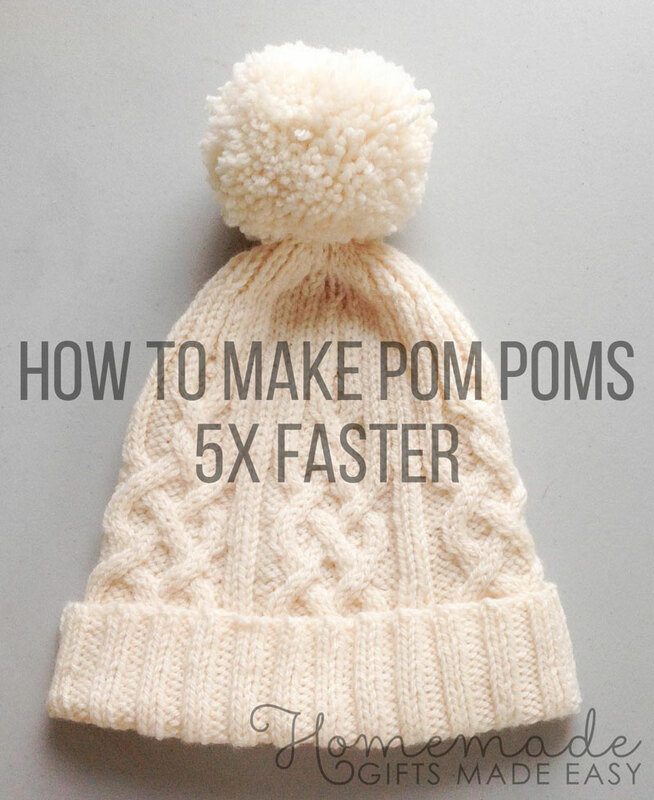 How to Make Pom Poms Five Times Faster! 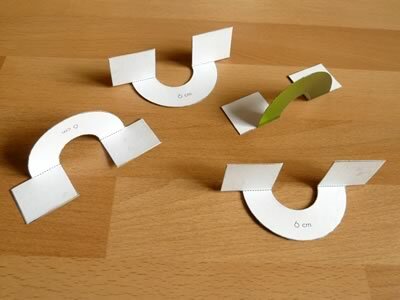 Sick of the cardboard circle method? I'll show you how to make pom poms much much faster! 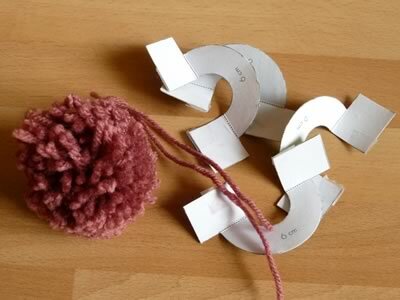 When I was about 10 years old we learned how to make pom poms at school using the traditional "cardboard circle" method . It was kind of fun, but it took forever , especially if you wanted to make a big pom pom. I wouldn't be surprised if this way of making pom poms was invented by teachers specifically to keep children occupied for an hour. It's just sooo slow! - thanks for sharing your photo Judy! I'll show you how to make pom poms about five times faster than the old way. You see, the time-consuming aspect of the traditional way is poking the yarn through the center of the circle over and over. So, if you want to make pom poms faster, you need to speed up that step or avoid it. You can actually buy plastic pom pom makers that are designed with this in mind. They come in two semi-circle halves that you snap together. 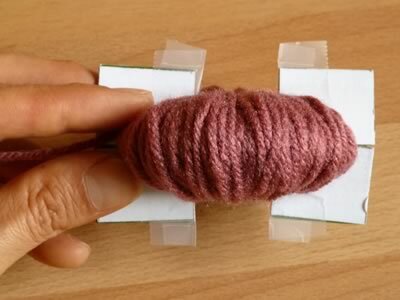 The idea is that you simply wind the yarn around each half, then join the halves to make a circle. 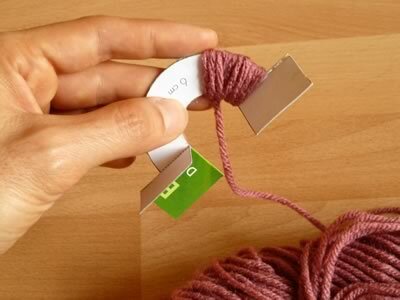 No poking yarn through a hole! These commercial pom pom makers work great, and really do let you make pom poms about five times as fast. You can buy one if you like, but you can just as easily construct a pom pom maker that works just as well using bits from around your house. Read on and I'll show you how. *Instead of using cardboard, you could plastic (e.g. 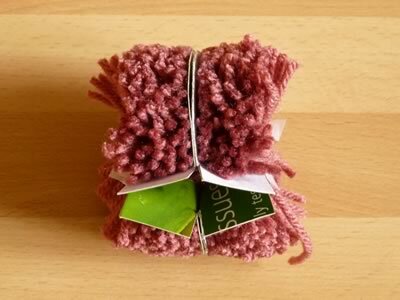 margarine or ice-cream container) to make more durable pom pom makers. Thanks to reader Jackie for the tip! 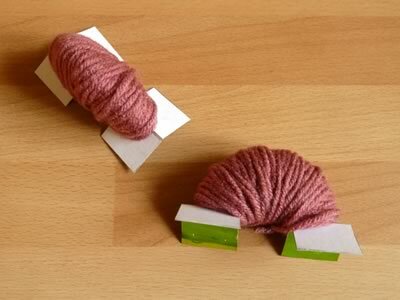 Keep winding back and forth until the semi-circle in the middle of the maker is mostly filled up with yarn, like the photo below, then snip the yarn. 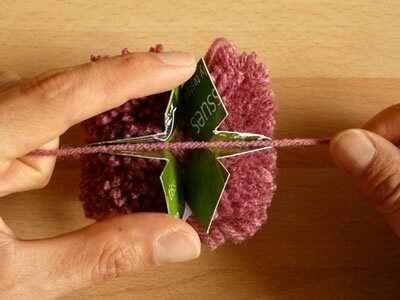 Winding the yarn like this is sooo much faster than the "traditional" method of making a pom pom with circles of cardboard, where you need to keep poking the yarn through the hole in the center! Put the two bundles together so that they form a full circle, like the photo below. 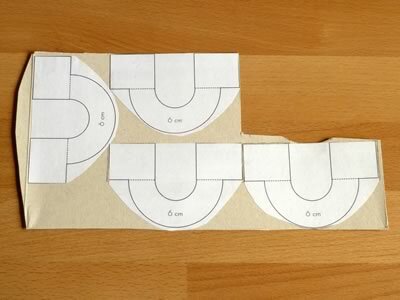 Use scotch tape on the rectangular tabs to hold the two halves together. 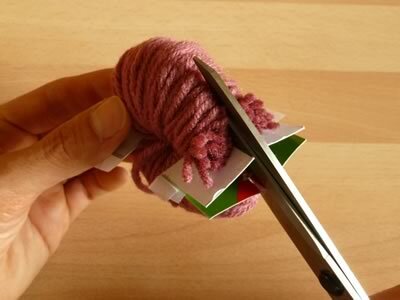 Slide a pair of scissors between the two layers of cardboard and snip the yarn, as shown in the picture below. The smaller and sharper the scissors the easier it is! 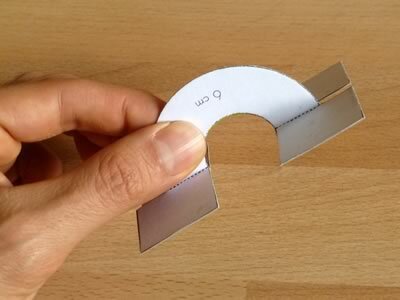 I only had this big pair of scissors at the time, which were hard to slide between the two layers of cardboard. 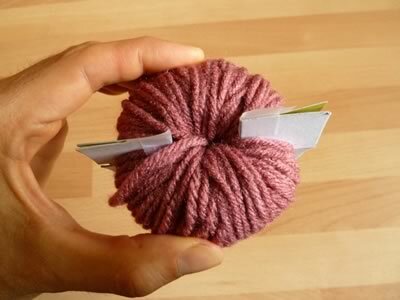 Your pom pom is probably roughly spherical (round), but a bit wonky and scruffy. Now for the fun bit! Give your pom pom a "haircut" and trim it to get it really circular. It helps to roll it gently between your hands first, to help spread out all the hairs. 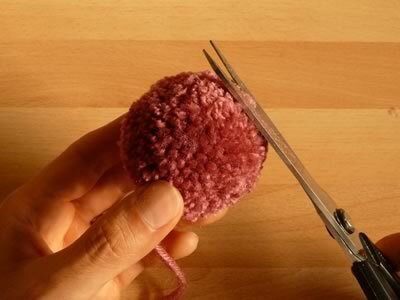 Then line up the scissors with the edge of the pom pom and cut off any bits that stick out. 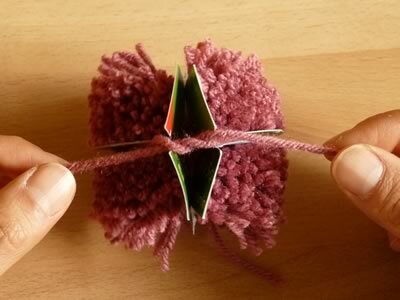 Keep turning the pom pom around and looking at it from different angles, and cut off any poking out bits. You'll be surprised how many you find! 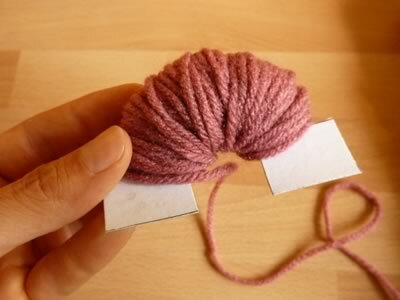 After a while though your pom pom will look really nice and round. I hope you had fun learning how to make pom poms the quick and easy way! If you have any questions of comments, or just want to say hi, then please leave a comment . 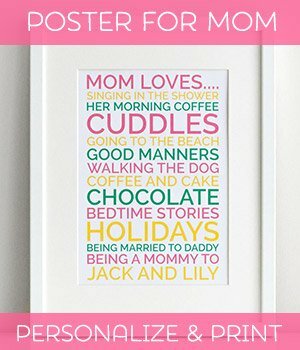 Looking for more unique homemade gift ideas? 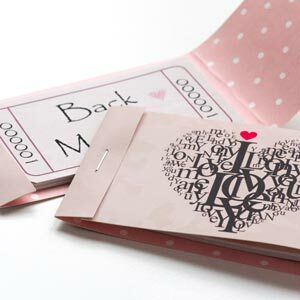 Check out our quick and easy printable gifts. 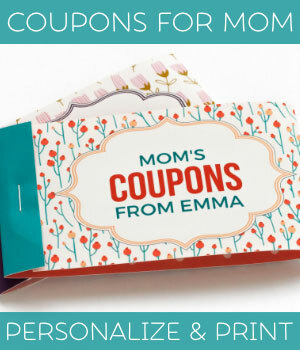 So easy to personalize and print at home! 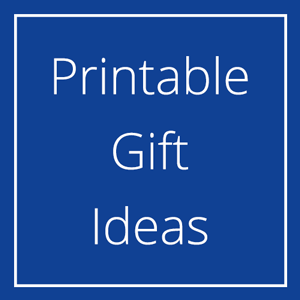 Printable coupons, "Likes" posters, "Year You Were Born" birthday posters, retirement posters, personalized newspapers... we have so many great ideas to help you celebrate most occasions.